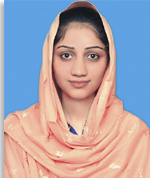 Rabya Aslam is an Assistant Professor at the Institute of Chemical Engineering and Technology, University of the Punjab, Lahore. She obtained her Bachelor in Chemical Engineering from University of the Punjab, Lahore in 2009 and based on her performance was awarded gold medal by the University. She joined the University as a Lecturer on September 17, 2009. Later, she obtained her Masters in Chemical Engineering from University of the Punjab, Lahore and was awarded by gold medal based on her performance. She completed her PhD studies from the University of Erlangen-Nuremberg, Germany and resumed her job at the institute in March 2016. She is currently involved in undergraduate and postgraduate teaching and research activities regarding reaction engineering and thermodynamics.